One blog that I am totally smitten with is Copy Cat Chic. This smart gal posts a photo of a most coveted home item, tagged with a most hefty price. Let’s say a couch. Then right below, a second photograph. An eye-rubbing–you-can’t-believe-your-eyes photograph of a very similar couch with an I can do that price tag. Go over and have a looksy. But then come right back because I’m going to show you how to make Kale chips, instead of paying $5.99 a bag for them. You can just call this my copy cat cook post. Kale chips couldn’t be better for snacking. Crispy, almost lacy, with a wash of sour and salt they answer one’s snacking needs dutifully. And the plus side? They are super nutritious. Kale has one of the highest concentration of nutrients of any vegetable, and is rich in Vitamin A, C, K, calcium, foliate, along with other vitamin and minerals. Plus, it just tastes good. My favorite store bought brand is Rhythm Chips. 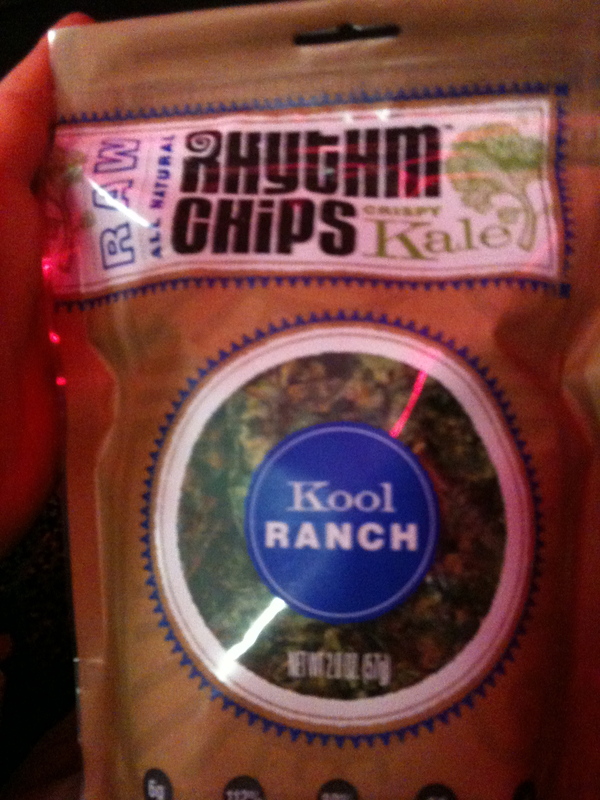 They have several flavors, but the Kool Ranch take the cake! Save for the vegetable overtones, you’d swear you were eating a dorrito. At $5.99 a pack, however, they become an expensive habit. After picking the brain of a coworker and a lot of interwebs research I ended up with a less cool ranch version, but super tasty baked kale chip that couldn’t be more simple to prepare. These chips are highly addictive and will likely only last around your kitchen for a day. But if you have more will power than me, you can keep them in an airtight container for 2 days. 1. Preheat oven to 350 degrees with the oven racks in the top and lower thirds. Line two baking sheets with parchment paper. 2. Wash kale and remove center rib. Cut the kale into large pieces, about 2″x2″. 3. Place kale in a medium bowl and add in the apple cider vinegar and salt. Use your hands to toss the kale. You want a bit of apple cider vinegar and salt on every piece. 4. Divide the kale between the two baking sheets, spreading the kale out so it does not overlap. Bunching the kale together will cause it to steam rather to bake. Steam=soggy=no good. 5. Place the baking sheets in the oven and cook for 20 minutes rotating the pans halfway through. At about 15 minutes I stand vigil by the oven to watch for signs of burning. depending on your oven, the size of the chips, ect, you may need to remove your chips a little earlier. If you are already baking kale chips, what other flavors do you use? So impressed that as a new mom, you have time to do all this cooking, and still stay skinny as a rake! Amazing! I wish I had 1/4 of your cooking talents. Thanks Cindy. I feel like all I do is work, cook, baby business, and sleep. Blogging helps me keep a sense of humor about it. Otherwise I have a feeling I’d be pretty bummed about going to be by 9pm every night and waking up at 4pm. ohmygod, that sounds fabulous! 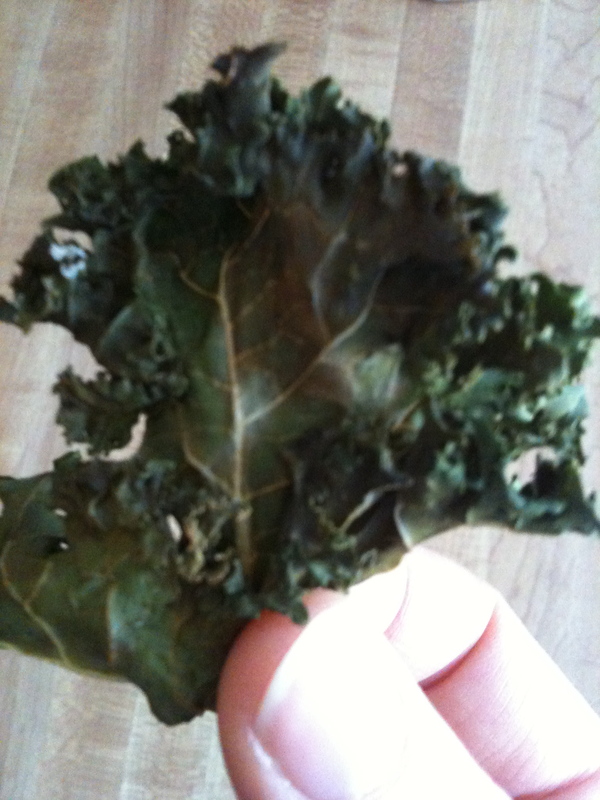 the mister loves Kale, but I’ve never been a big fan as it’s always felt a bit leathery … I might try it this way, though! and good luck on your diet! you are a far better person than I! I will have to try that version. I usually use olive oil, and sprinkle them with smoked paprika before the bake which is really good.